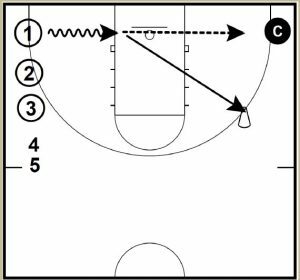 These 5 basketball skill development drills came from the Stephen Curry Skills Academy and are a part of Alan Stein’s 12 Volume Basketball Coaching Nuggets. The entire Curry Academy volume has 82 pages of basketball skill development drills. If you like these drills and think that other basketball coaches would be interested in seeing them, please consider clicking the Facebook like button or using the Twitter button (both are to the left of this text) to tweet the link to this page. Thank you! 1. Defenders put hands on Offense shoulders while Offense drives across the floor through the pressure. 2. Offense takes power dribble stance and faces baseline. Player 2 puts forearm on Player 1’s inside shoulder and gives contact. Player 1 then step-slides up the court. 3. Player 1 will be advancing the ball while Player 2 is trying to ride him out on his inside shoulder. It’s Player 1’s goal to cut into the path of Player 2 and veer behind him. Once there his goal is to stay on the inside position by keeping contact. Contact is never an excuse to lose the ball!! Hitting the shooter in his or her “shooting pocket” makes a huge difference in the shot going in. Even in the NBA when players have to reach up, down, or sideways to catch the ball, it throws off shot preparation. Then it’s live 1 on 1. You only get one shot. Offense stays if they score. It’s then 1 on 1 with a limit of three dribbles and one shot. Offense stays if they score. If Player 1 fails to get open within a time limit of five seconds, then his possession is over.